Hello fellow campers! I’m Sharla Krenzel of Thistle Thicket Studio and I’m so happy that you joined me at my cabin at Camp Oda May. Today we’re going on a hike and the first thing we’ll encounter on our adventure is a fork in the road where we’ll choose Path A or Path B. I’ll be your guide if you choose Path B which will lead us to Cross Creek. Mona Phelps will be your guide should you choose Path A that will lead you to Four Points, which was posted on Monday, July 2. Let’s take a hike! After a short hike down Path B we arrive at Cross Creek. There are a couple of ways to cross the creek, which I will share both options with you today. Note: There is a new adventure coming – cornerstones!! On Friday, a cornerstone option for this round will be posted. Should you choose to include the cornerstones in this round, you will only need to make 28 blocks (14 medium and 14 dark) instead of 32. 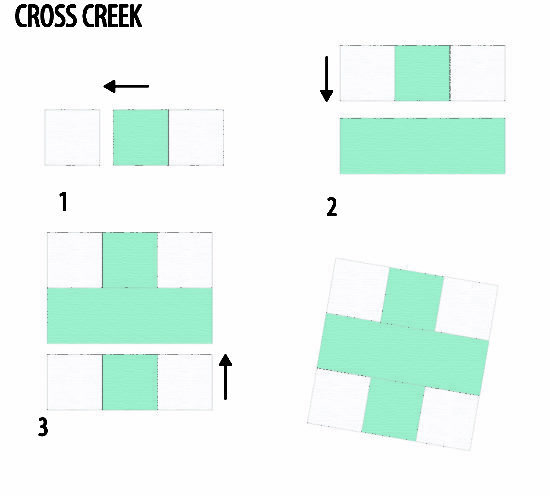 In parentheses are the cutting instructions for the Cross Creek block if you plan to make the cornerstones. 1. Sew a 1 1/2″ background square on either side of a 1 1/2″ color 1 square. Press seams towards the background squares. Repeat for a total of 32 (28) sets of color 1 and 32 (28) sets of color 2. *Tip: This is a good time to check the accuracy of your 1/4″ seam allowance. Measure the length of your 3 square unit. It should measure 3 1/2″. If it is smaller than 3 1/2″, adjust your needle to the right to sew a smaller seam. If your unit measures larger than 3 1/2″, adjust your needle to the left to sew a larger seam. 2a. Sew a 3 square color 1 unit on either side of the long side of a 1 1/2″ x 3 1/2″ color 1 rectangle. Press seams toward the center strip. Repeat for a total of 16 (14) color 1 Cross Creek blocks and 16 (14) color 2 Cross Creek blocks. 2b: Sew a 1 1/2″ color 1 square on either side of a 1 1/2″ color 3 square. Press seams towards the center. Repeat for a total of 16 (14) sets of color 1 and 16 (14) sets of color 2. 3. Sew a 3 square color 1 unit from Step 1 on either side of the long side of the 3 square color 1 unit just sewn in Step 2. Press seams towards the center. Repeat for a total of 16 (14) color 1 Cross Creek blocks and 16 (14) color 2 Cross Creek blocks. Unfinished block should measure 3 1/2″ square (finished 3″ square). Step 1: Sew 7 blocks together in a strip, alternating color 1 & 2 blocks, starting and ending with color 1 blocks. When sewing your blocks together, rotate blocks so that the seams nest together to reduce bulk and to help with matching corners. Repeat for a total of 2 block strips. Block strips should measure 21 1/2″ long. Sew one strip on the right and one strip on the left of your center medallion + 1st border square. Step 2: Sew 9 (7) blocks together in a strip, alternating color 1 & 2 blocks. starting and ending with color 2 blocks. Repeat for a total of 2 block strips. Block strips should measure 27 1/2″ (21 1/2″)long. Sew one strip on the top and one strip on the bottom of your center medallion + 1st border square. Note: If you plan to include the cornerstones options in this round, use the numbers in parentheses in Step 2. Once your cornerstone blocks are completed, sew one block on each end of the Step 2 strips. Block strips should measure 27 1/2″ long. Then continue sewing on the block strips as instructed in Step 2. Your unfinished medallion square should measure 27 ½” x 27 ½”. I hope you enjoyed our little hike today! I’ll be back in a couple of weeks to take you on another adventure. In the meantime, you can follow me as I sew along with all of you on this QAL adventure on Instagram @thistlethicketstudio, on Facebook at https://www.facebook.com/thistlethicketstudio/ or on my blog at www.thistlethicketstudio.com where I’ll be sharing sewing tips for this QAL. 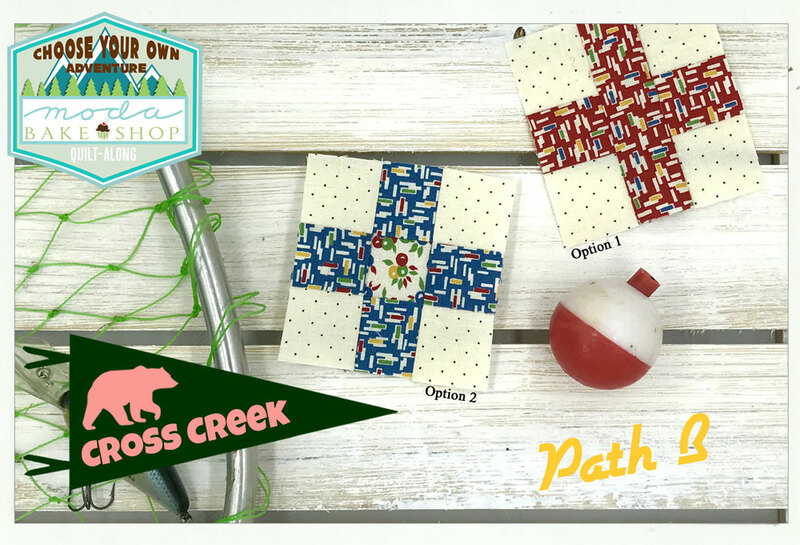 This entry was posted in Events, Layer Cake, Quilt and tagged American Jane, Choose Your Own Adventure QAL, Oda May's Summer Camp, Play All Day, Quilt-Along, Sandi Klop, Thistle Thicket Studio. OK after seeing this border going to get started on this quilt!!!!!! LOVE IT! So glad you are loving this QAL! Be sure to share your blocks on the Moda Bake Shop or Moda Bake Shop Bakers Facebook page! Is there a step missing? Where are the instructions for making the center strip for the Crossing 2? Thank you Pamela for catching that! The missing step is there now. I love it, Sharla!! Your quilt is turning out beautiful! If I am following this right, we are putting these squares around what we pieced previously, correct? 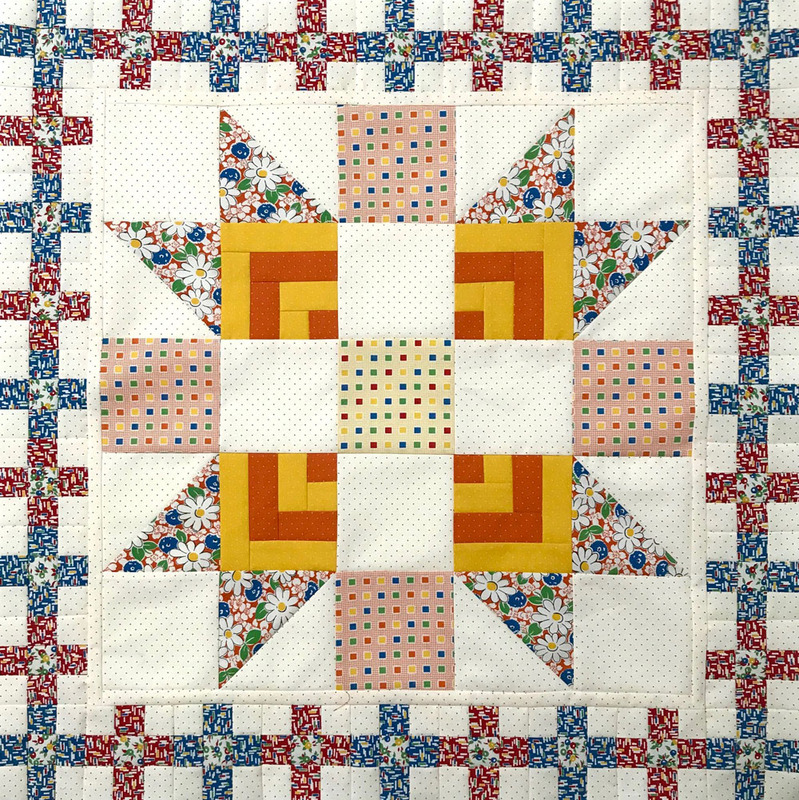 Yes, a medallion quilt is traditionally a center square with a series of borders placed around the center square. Thanks for the update on instructions, the printer friendly version needs updating, too. I’m confused. The instructions say to sew 14 of each colorway if using cotnerstones. However, if each section starts and ends with the same color, 16 blocks are needed of one and 12 of the other colorway. Did I miss something? When sewing the blocks together, the instructions say to alternate color blocks. In Step 1, it says to start with color 1 block. In Step 2, it says to start with color 2 block. That alternates the blocks so that there are 14 blocks used of each color. But you can certainly make 16 blocks of color 1 blocks and 12 of color 2 blocks, then you would start each strip with a color 1 block.